Today is a special day as we are kicking off our wedding vendor interview section, and it also is a chance to provide this Sugar Flower Shop interview with owner Amy DeGiulio. Needless to say we are very excited! During research for one of our articles we found Amy and Sugar Flower Shop. We were immediately impressed with the beautiful cakes and amazing sugar flowers featured on the website. The sugar flower arrangements are amazing, and it is often very difficult to tell the difference between them and real flowers. 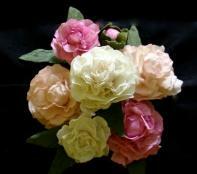 They are the perfect cake topper or accent item for your wedding cake. Sugar Flower Shop has been getting a lot of much deserved coverage in the media recently, and we are glad that Amy was able to take a few moments to tell us more about herself and her unique business, Sugar Flower Shop. 1. Hi Amy, thank you for sharing your time with us today. Please take a moment to introduce yourself to our readers, and tell us a little bit about your company Sugar Flower Shop and the beautiful sugar flowers you create. 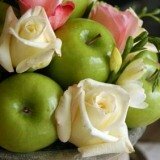 Thank you for contacting Sugar Flower Shop. I would be honored to be the first interview in your vendors section! Sugar Flower Shop creates cakes made from the freshest ingredients featuring realistic (shippable) sugar flowers that are lasting keepsakes. 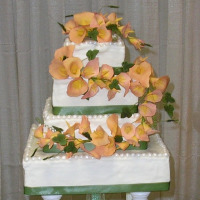 We will create cakes for any size wedding, and cake flavors include white, yellow, devil’s food and red velvet. Buttercream and mousse fillings are also available in various flavor combinations. For those wishing to enhance their homemade, destination or bakery ordered cake, sugar flower arrangements can be purchased and shipped anywhere in the world. Individual flowers are hand shaped and painted, and they can be attached to a cake individually or combined for a grand flowing effect on a tiered cake. 2. Are there any interesting facts about your life that you would like to share with our readers? Most people would be surprised to find out that I have a degree in Mathematics and once worked as an actuary. I am also a former world champion baton twirler, and I currently coach reigning state, regional and national baton twirling champions. 3. What sugar flowers were the most popular for the spring wedding season, and what do you anticipate being popular for fall? Poppies, roses and peonies were the most popular flowers this past spring. The colors ranged from muted pastels to vibrant reds with lots of pink in between. I find that overall, color trends in just about everything follow fashion, which follows our connection with the world. These days, we are looking toward a secure future, both financially and environmentally. I believe that natural fall colors, a touch on the foggy side, will dominate cakes for the coming season. 4. You say “Anything Is Possible” on your website. 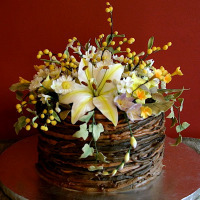 What is the wildest, most unique cake or sugar flower design that you have created for a customer? I have created unique flowers such as a giant peony that took up most of the top of a 6" tier. Currently, I am challenging myself to reproduce Oprah's Legends Rose, which has gigantic petals that can cover a child's palm. 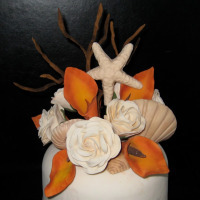 I have also ventured into sculpted, non-flower, objects such as ducks, pianos and seashells that can act as cake toppers. 5. There are many options and styles when it comes to wedding cake design. What advice can you give a bride that is just starting to think about her wedding cake? When meeting with a bride (either in person, by phone or even through e-mail), I try to find out the feeling she wishes to evoke when looking at the pictures of her wedding cake in the years to come. Does she want it to say elegant, modern, whimsical, decadent, elaborate, unique, simple, etc.? Paying attention to the adjectives gives me great insight into how I am going to please the bride I am working with. I also like to get a sense of color preferences by looking at swatches or images. 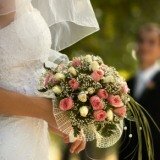 Finally, we can discuss specific flower choices, deciding whether to exactly match flowers from other aspects of the event or provide a sharp contrast. 6. You have been receiving a lot of media attention lately from some big names like Macy’s, Martha Stewart Weddings and the STYLE Network. How does that make you feel? I am very grateful for the recent media attention I have received. Much of it has come unexpectedly. It is exciting to receive praise from industry insiders. 7. You appear to be very comfortable speaking in front of the camera and large groups. Any chance we will see you on your own show in the future? Performing does come fairly naturally to me, probably from being a baton twirler. I would absolutely LOVE having my own show. I can envision anything from a reality show about finally opening my cake boutique here in NYC to a demonstration show on how to make sugar flowers and arrange them on cakes to reporting on current cake trends that are happening at cake shops all over the country. I just need the Food Network to call me! 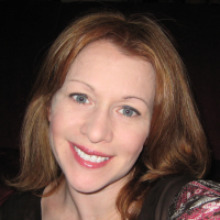 Thanks again, Amy, for taking time out of your busy schedule for this interview. We hope that the Food Network will call soon! For more information visit the Sugar Flower Shop website.